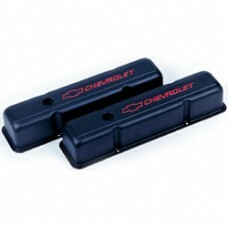 These GM valve covers are made from heavy gauge pressed steel to prevent distortion. They incorporate GM-designed baffles and feature recessed CHEVROLET and the Bow Tie emblems. These tall covers clear many roller rockers (check before use) and are finished in black crinkle with red inlaid in recesses. Application: 1959 and later Small Block Chevrolet with perimeter hold down valve cover fixings. See matching air-cleaner GM141752, timing cover GM141215 and breather GM141754. Price is for a pair.